Pull-ups work your biceps, lats and middle back muscles. Doing pull-ups with the proper form, alternating your grip and increasing repetitions can help you bulk up these muscle groups to give you the muscular physique you are working to achieve. While pull-ups can be challenging at first, mastering them can help you add strength and bulk to your upper body and make the straight bar seem less intimidating. To ensure pull-ups work the appropriate muscle groups without injury, you must do them with the proper form. To perform the standard, medium-grip pull-up, hold the pull-up bar with your palms facing forward and spaced shoulder-width apart. Depending on the height of the bar, you may need to jump or use a step to grab it. Your legs should be crossed and bent at the knees while you perform the exercise. Keep your lower back slightly curved and your chest out, Bodybuilding.com advises. Exhale as you use your upper arms and shoulders to pull your body up until your chest touches touches the bar. Hold the position for a second and then inhale as you lower your self back to the starting position to complete one rep. Doing pull-ups with various grips will focus the exercise on different muscle groups and help you achieve greater overall upper body bulk. Wide-grip pull-ups focus more on the lats than do traditional, medium-grip pull-ups, which put more emphasis on the biceps. Wide-grip pull-ups should be done with your hands positioned further apart than shoulder-width. Close-grip pull-ups focus more on the lower lats and should be done with hands positioned closer than shoulder-width apart. With chin-ups -- a variation of pull-ups -- your palms are facing in toward you rather than forward. This variation emphasizes the biceps, forearms and lats, and should be done with hands positioned shoulder-width apart. In order to increase strength and add bulk by doing pull-ups, you must increase the number of reps you are able to do. Beginners may only be able to do one or two reps per set, or they may need to begin with one foot on a stool until they are able to pull their body weight unassisted. Do as many pull-ups as you can per set, keeping proper form, then rest for a couple of minutes and repeat. Even a small number of reps per set add up. 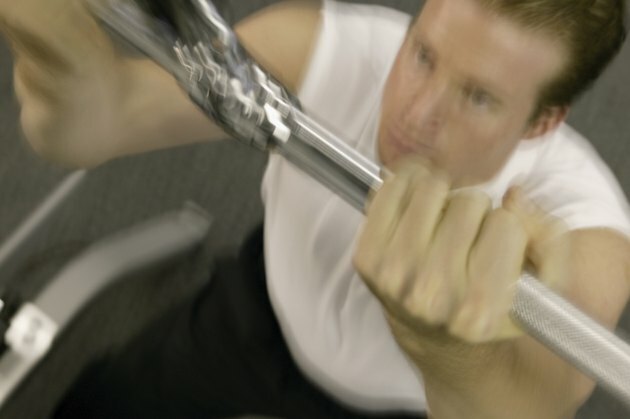 Once you master the beginning number or reps, increase them by one or two per set. Continue in this manner until you see the upper body results you are looking for. Once you are able to do pull-ups easily, you may need to add extra weight to give you that extra bulk. You can do this by wearing a weight belt that allows you to add weighted plates. Start by adding a small amount of weight, between 5 and 10 pounds, and do your normal pull-up routine with the number of reps and sets you are use to. As that becomes easy, add weight in 5-pound increments until you get to the size you want. Once you achieve the physique you are looking for, continue with that amount of weight and number of reps and sets to maintain that size.